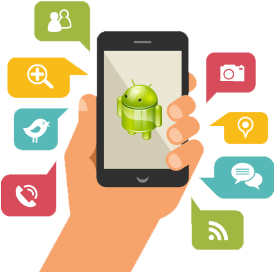 Creative infoway is renowned Android app development company offering professional android app development services. Our Professional team of android app Developers perform deep research and analysis to meet your requirements and expectations. Accessing wide range of tools and technologies we create customized applications which are powerful and scalable for any android devices. We are providing android application development service globally. Open source Android platform was chosen by Google to make its entry in the mobile device arena. Being a backbone of more than 50% mobile devices across the globe, Android has actually formed a cult. Architecturally robust, this platform offers plenty of opportunities for Android app developers to build distinct and innovative applications for smart phones, tablet PCs and other mobile devices. Custom Android application development is our forte as we develop applications in accordance with the customer specifications. Whether you need a personal app or an absolute business application, we formulate flawless Android app development for you. From modifying framework APIs to integrating third party apps on the Android platform our Android app developers does it all with finesse. The diverse characteristic of Android, being an open source platform, has encouraged several popular companies come out with a variety of different Android based Smartphone’s creating a boom for Android based applications in the market that captured the attention of the world. The biggest and greatest advantage of this platform is that being an open source development platform, it requires less investment while it promises a handsome return on investment and that is one of the biggest reasons that Android application development has become a greatly beneficial business for independent application developers to make good money. Android App Development is in great demand in the world market due to enhancement in numbers of smart phones that run using Google Android OS. A Linux-based operating system, Android is one of the most popular and best utilize mobile platform. Universal Technolabs, as a leader provider of mobile application development services offer dedicated and experienced services by utilizing domain expertise, technical ability and unmatched creativity of its veteran team of professionals. The Android development work to be done by an Android App developer is quite complex. Thereby, it is important that an experienced team of a well known Android Development company India is hired. These teams need to have the requisite developer tools in order to create, test and debug such apps. This is where we come in, as our engineers and developers have a habit of taking on challenging projects and emerging with the best results. Technology used by us includes the Android SDK, Media APIs, Location-based Service APIs, Wi-Fi APIs, security architecture, OpenGL and 3D graphics, for providing our clients with the best experience.